As many of you already know, Alison Sudol (AKA: A Fine Frenzy) is an incredibly talented musician with the voice of a SPARROW ANGEL! My favorite songbird beauty just released a new single from her upcoming album “Pines” called “Now is the Start”. It’s such a fun, happy song! Click here + listen! The photoshoot for this album was such a blast and was shot by our good friends Angela+Ithyle. Ali and I wanted to do something timeless with her hair– something that wouldn’t distract from all the pretty lights, stripes, and um- giant SAILBOAT!! Sometimes when there are a lot of fun things happening in a photo (or even with your outfit) you just want to keep it classic + simple, right? So that’s what we did. Luckily, our darling Alison was kind enought to pop by TBD and show us how to recreate this textured french twist on herself using a secret little tool… chopsticks. Here we go! 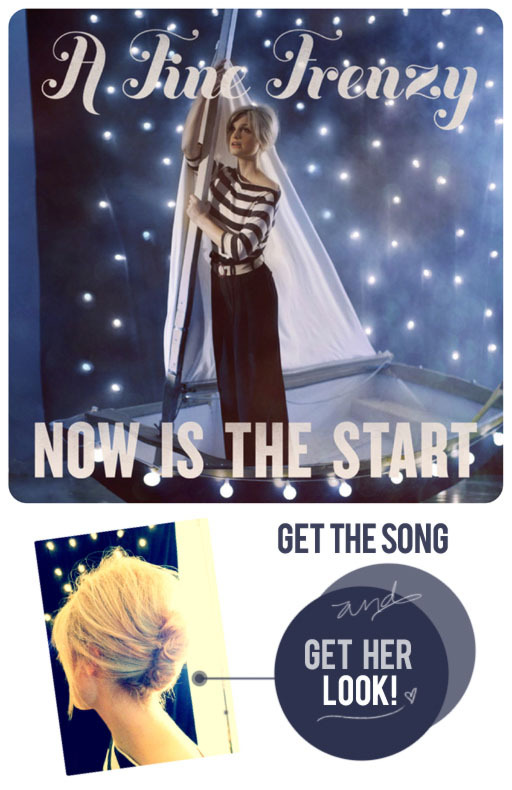 First things first, click play on “Now is the Start”. 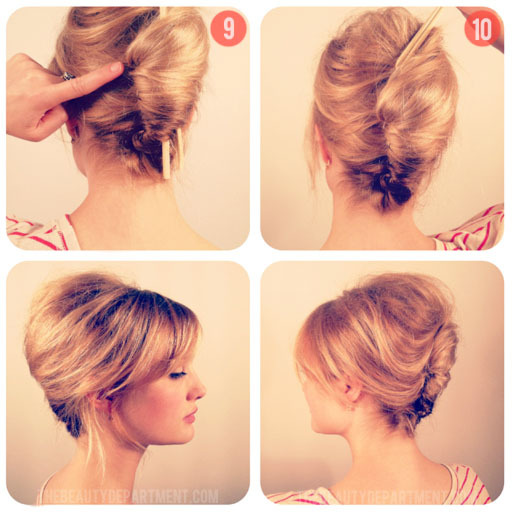 You should be listening to it as you do this updo! 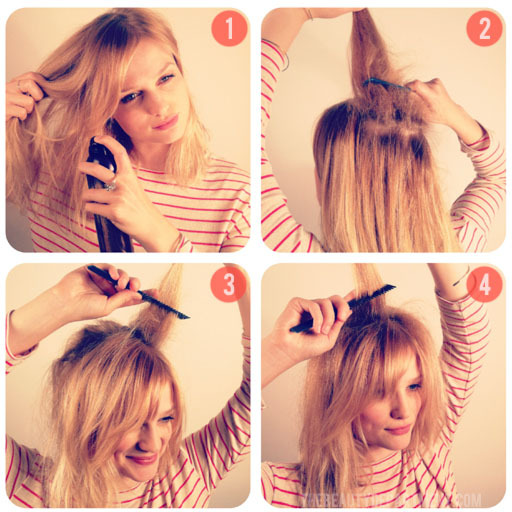 Adding texture to the hair before you start is really important with this ‘do. My new obsession for texture is THIS stuff. It stays soft + pliable and doesn’t get salty/crusty like a lot of beach sprays can. Tease the crown area of your hair. Tease the left side of your part. Tease the right side of your part. Grab all of your hair in one hand and give a little tease to the middle and ends. Don’t be too neat. Personally I think this updo looks best when it’s a bit messy. Join all of your ends together using a small clear elastic. You want to gather everything slightly to the side because when you go to roll it, it will end up in the middle of the back of your head. Put the clear elastic between two chopsticks and squeeze. Roll it up! If it doesn’t end up in the center, unroll it and try again! 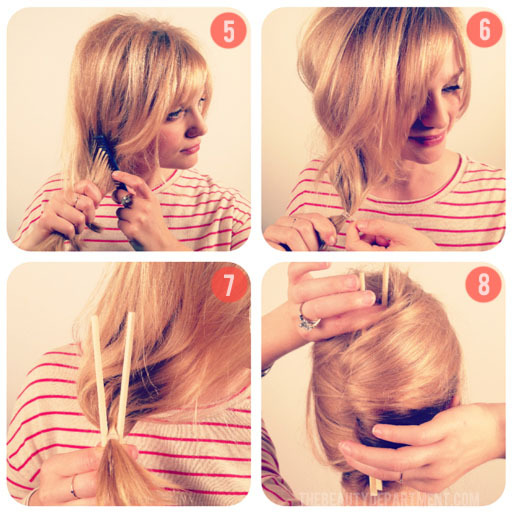 Hold the updo against your head with the chopsticks while you put some pins in. We like large bobbypins for extra support. Updos like this can get quite heavy. Also, be sure not to pin the chopsticks! Otherwise you won’t be able to get them out. Once you feel like everything is secure and in the right place, slide the chopsticks out. Pull out some pieces around the front to soften this look. Give it a good spray with a strong holding hairspray.